I receive a lot of emails from women who are struggling with how to stop being bulimic and want advice. As I sift through all of their stories and my responses to them in my mind I had this visual pop into my head. Recovery is like a wine cork floating on the surface of water. At first it didn’t make sense to me, but I remembered listening to an Abraham Hicks video about how our natural state of being is joy, love and appreciation. Feelings that uplift and connect us to our Source. Just like the cork our attitude, our energy and our spirit want to rise to the top of the surface and be light and float-y. Well, if that’s true then every day I was living like under a spell with bulimia I was doing that, too. So what does that have to do with the cork? Well, if we are the cork and it’s natural for us to float to the surface and live a life of joy, abundance and love then it’s up to me if/when I hold my cork under the water. What I didn’t realize then that I do now is that I’m responsible for whether my cork floats because I can consciously allow my cork to float or I can go unconscious, take a deep breath and hold my cork under the surface. I can bob along on the surface or I can hold myself under water. That was totally freeing for me! I loved how Jackie said “there is pain in life but suffering is optional“. It’s true! I’m the one who holds my cork under water or allows in the well being so it floats. 1. When I am aware of my state and focus on feeling a little better moment by moment. 2. If I look for things to appreciate around me I will find things and my energy and attitude will align with love. 3. If I stay present when I have an urge to binge or think a negate thought and remember I’m bigger than my thoughts. 4. When I treat myself like a valuable human being worth loving I allow my cork to float. That’s what came right away. I hope all of this makes some sense if you want to know how to stop being bulimic. It’s a little out there, but it all ties back to choice and I really think we have a choice to suffer or thrive. I’m pretty tired today, but I’m not letting that be my focus. I ‘m focusing on what I can do to uplift myself and feel good in the moment. I may not feel outstanding, but that’s ok and if I just allow well being into my body, my heart and my spirit I will feel good. yes, Polly!! that’s what I needed to here today 🙂 I love the metaphor of the cork and how we have the power to float. I need to work on #3 of your insight list. I have to remember that I am bigger and stronger than my thoughts and impulses. Thanks again! Whew – glad to hear you got what I was talking about. I felt like I was totally rambling, but had in my heart the notion I wanted to convey. I’m glad you got it! Thanks for your response Polly! Do you have any tips on how to get better at #3? I did a post recently with a few ideas for how to stop a binge. There was such a great response that I’m working on an expanded version of those ideas (an ebook actually). 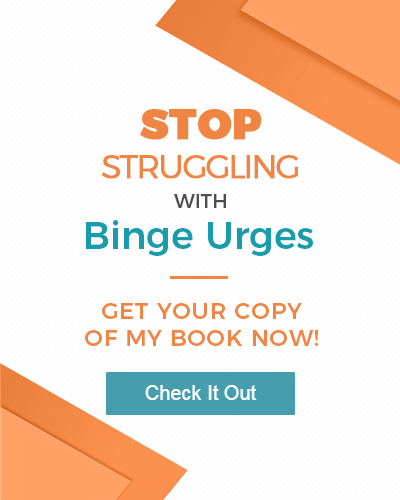 The ebook will include practices and exercises to help you stay present and grounded when the urge to binge comes on. Plus I’m explaining where I think the urge to binge comes from. One thing I’ve learned from my research – and just my experience in recovery – is that understanding what’s behind the urge has made a huge difference to me. I’m a bit of a logical thinker so when I can understand what’s driving the obsessive thoughts and urges around food I was better able to step outside of myself and see that my eating disorder was running the show. It helped me to get a sense that I (big ME that is) am the observer having thoughts and urges and I need to remember that when the urges come up and separate myself from the habitual thoughts by staying aware of myself, checking in with my body, being aware of my breath and not attaching myself to my thoughts. That all sounds a little complicated, but when you start to understand the way we operate as human beings and what the fight or flight response is all about, you can start to see a way out. Hope that’s helpful to you and please email me if you’d like to talk further. Happy to help! That really made me feel more positive! ‘There is pain in life, but suffering is optional’ really spoke to me. I’m currently trying to recover from an eating disorder myself and have tried to start blogging about it. Hopefully you can take a look and maybe give me some advice on what to do? Sweet of you to stop by and say HI! I’ve only just read a few of your posts, but I want to congratulate you for coming out and starting your recovery – and your beautiful new blog. I think blogs are a great way of expressing yourself, so keep at it. By that I mean do what makes you feel good and uplifts you. Sounds like you get what I mean if you felt better after reading this post. That’s what I mean. If it makes you happy, brings you joy and moves you closer to feeling relief from resistance, stress and feeling unlovable then do that! Life is supposed to be good for you. Claim it. Totally rambling here…just happy to hear from you and wishing you light and love. I like the comments you made about staying present at the times when you feel the need to binge or let negative thoughts come in (which will most likely lead to a binge) because everyone who has ever struggled with bulimia knows the absolute hardest part in recovery is resisting acting on the desire. Without that point, the rest of the points would be unnecessary. Having a tangible and specific action to take in the very moment of truth is the ultimate vital need. I also appreciate the concept of not focusing on the problem we may be experiencing, (such as the example you stated about feeling tired, or even the urge to binge), but instead focusing on the things that will allow our “cork to float”. I can totally relate to the metaphor. It allowed a visual concept and understanding of what is actually going on instead of numbing out and choosing to not deal with what is causing me to even want to binge anyway, and keeping me in check about what it is that I ultimately desire which is my cork being allowed to float with the solution that isn’t temporary and not genuine. Also, it’s a perfect reminder that just because the cork isn’t floating doesn’t mean the cork isn’t still there, or lessen its value in any way. Thank you for sharing what was impacting for you, it helps me a lot in a real way. I love what you said and you’re spot on! Our cork, our natural well being, our loving/lovable/loved self wants to be joyous. It’s our job to align more, resist less and let that natural showering of happiness and self-love be ours. It takes practice. It takes being mindful. It takes choosing empowerment over disempowerment.